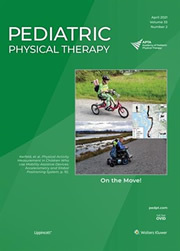 Advancement of research and translation of evidence into pediatric physical therapy practice is one of the goals of the Academy of Pediatric Physical Therapy Strategic Plan. To meet this goal, the Academy carries out a number of activities to support and promote research, including research grants, research awards, research summits, and review of abstracts for conferences. Click on the links above for more information. Have questions about our Committee? Contact the Chair of the Research Committee. Thubi H.A. Kolobe, PT, PhD, FAPTA is a Professor and the Ann Taylor Chair for Pediatrics and Developmental Disabilities at the University of Oklahoma Health Sciences Center. 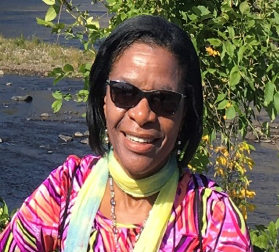 She received her doctoral training in pediatric physical therapy at Hahnemann University (now Drexel University). Dr. Kolobe is also a co-developer of the Test of Infant Motor Performance (TIMP) for preterm infants, a norm-referenced test that is used worldwide. Her current research focuses on movement learning and skill acquisition in infants with or at risk for cerebral palsy. The overarching goal of Dr. Kolobe's research is to prevent developmental delays and reduce the significant functional limitations, cognitive and educational achievement gaps that are experienced by many infants with brain insult. 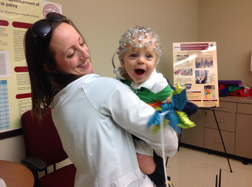 Dr. Kolobe's research also seeks to understand neural correlates of infant motor learning. Although research suggests that interventions that produce sustained gains tend to also show changes in brain structure and functioning, the brain-behavior relationship during infant learning of complex motor skills is poorly understood. Dr. Kolobe's research has been funded by the National Institutes of Health (NIH), National Science Foundation (NSF), Foundation for Physical Therapy, Presbyterian Foundation, and the Section on Pediatrics of the APTA. Dr. Kolobe and her collaborators have recently completed a five-year $1.2 million NSF funded study on prone locomotion in infants with and without CP. The study, which expanded on an earlier NIH funded validation study of the Self-Initiated Prone Progression Crawler (SIPPC) system, explored how infants with and without brain insult learn to use the SIPPC system to explore and crawl. A collection of robotics and sensor technology, the SIPPC system is not only a training device, but it also captures, promotes, and measures movement learning in very young infants in real time. Another unique feature of the system is that it rewards self-initiated movement effort, however subtle, and permits error learning, thus enabling researchers to test the effectiveness of two prominent approaches in motor learning; reinforcement and error-based learning. Reinforcement movement learning has gained prominence in the movement science literature and has shown the potential to accelerate movement learning in adults. The benefits for very young infants, particularly those brain insult such as with CP, are unknown. Indeed, very little is known about how infants with brain insult learn new motor skills. Self-initiated prone locomotion occurs in typical infants as young as 6 months of age and is believed to be integrated with other systems essential for development, school readiness, and social interactions, such as vision, arousal, and perceptual-cognition, making it a pivotal target for intervention. 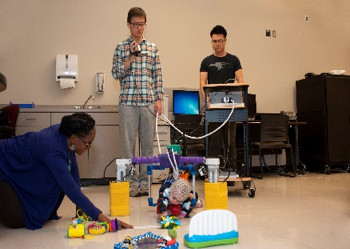 Robotic and sensor technology like the SIPPC allows us to teach a skill before it emerges or fails, thus enabling us in real time to capture and study the evolution of learning strategies. For interventions to promote neuroplastic changes and skill acquisition in infants, integration of at least 5 things is important: task-specific training, novelty, high repetition, stretching performance boundaries, cognitive orientation, reward- and error-based feedback. Technology can provide all 5 at the same time. Currently, Dr. Kolobe is also a Co-PI on a funded 4-year $1.6 million IES grant (Dr. Sandy Arnold (PI) and Dr. Everett Smith (Co-PI)). The goal of this national study is to validate the School Outcome Measure (SOM) for children with disabilities who are receiving school-based physical and occupation therapy services. When completed the SOM will be ready for use as an outcome measure in school settings. Mentored grant ($9,675) to Jason Cook titled Caring for Children with Severe Cerebral Palsy: The Lived Experience of Parents. Research II grant ($9,765) to Alyssa Fiss titled Gaining insight and Understanding of Experiential Learning in Pediatrics PT Education.